I love fishing a Rogue. I prefer the floating Rogue over the suspending one only because of the thrill I get when I see a big bass come up and hit it on or just under the water’s surface. I have been somewhat of a junkie of topwater fishing all of my life. In the Spring, don’t forget to throw an orange-belly (I prefer the silver/black with the orange belly) Rogue in water that has grass below the surface. Work it down deep enough to where you feel the top of the grass then let it float to the top. Most of your strikes will occur while the bait is rising. It’s funny, but when I fish a sinking jerk bait like a Fluke, it seems that most of my hits are when the bait is sinking. When I fish a floating jerk bait like the Rogue, most hits come when it is rising. It seems like bass really like the bait when it is doing its natural activity whether it is sinking or floating. Anyway, don’t forget about those jerk baits. Sometimes they will work when nothing else will and they are always a lot of fun. 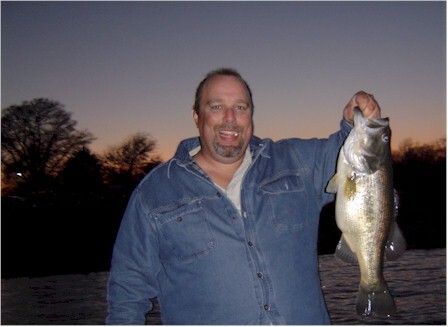 Reliable tales tell me that fishing Birch Creek with a Culprit worm, motoroil color, has been producing some nice bass. While I have been out of town and unable to fish, they are biting on Birch Creek. Look for the clear water about 6 feet deep along the western bank of the creek and work the hydrilla. If they aren’t biting near the bank, be sure to back off the bank a bit and see if they are in the deeper water. I prefer to fish the 10 inch worm this time of year. When water temps are consistently above 65 degrees I move from 6 inch worms to the longer ones. Big bass get stacked up in Birch Creek this time of year so be sure to visit it while you are out. It is just a short run north of the 515 bridge on the west fork. There is a public landing immediately south of the 515 bridge off of Hwy 17. This area is busy this time of year. Remember to have some respect for other boats and your fellow bass fishermen. Being a fair-skinned person, the sun is always an issue with me. I can’t count the times I have gone fishing in the morning with the intent on coming in before the sun starts beating down on me, gotten on fish, forgotten about the sun and ended up with a nasty sunburn as a result of it. Every time our skin gets burned from the sun, a small amount (or more, depending on the severity of the burn) if permanent damage is done. Over the years this can take toll on our largest organ, our skin. Today we have garments that are made to block the dangerous UV rays of the sun. You might think, “Don’t all clothes block the sun?” The answer is an emphatic NO. Some of our favorite clothing is loosely-woven fabrics that breathe well and are comfortable. Unfortunately, many times enough UV rays can penetrate these garments to burn your skin right through your clothes. The shirts shown below will block the rays of the sun while maintaining your comfort. Make sure to get them big enough to fit loosely for maximum comfort. Also take a look at ExOfficio.com. They feature a line of SPF clothing that is perfect for fishing. They are a little pricey, but you only have one skin. You can find more information on protecting yourself from the sun’s UV rays at Sunblock-Clothing.com. Below are some products I reccomend to help keep your skin in good health as you spend your time fishing Lake Fork. I say you have to have the right shoes for fishing. Most people wear their favorite tennis shoes and that is fine. Some fishermen wear running shoes, some wear sandals and some wear none I guess. I have found that when I plan to be standing while fishing, something along the lines of a sneaker is good, but if you shop around a little you can find great shoes to wear while fishing that are functional. In a fishing shoe you want something that will remain sticky in wet conditions, will dry quickly if immersed in water and will not get stinky if you wear it wet. I did some research and these are what I found. I can be found most days on the lake wearing my Keen sandals. Keen makes great shoes for outdoor purposes. I got my first LCD depth finder in about 1988. I thought how cool it would be to be able to see the fish. All of a sudden, I realized I was always around fish, according to the screen. But are those really fish? I wondered, and still do. Today’s LCD depth finders have a much higher resolution screen, many have GPS capability, water temp displays, they show how hard the bottom is and how thick any suspended grass is. They also still show those fish down there…and I still wonder if those are fish or not. If they are fish, are they bass? The instructions to my Lowrance LMS-332 are pretty vague about this. The unit is packed with great features, but I have learned over the years not to put any stock in any fish that this thing shows. What prompted this thought was someone telling me last week that they saw fish in 10′ of water all day on Lake Fork and fished for them but didn’t catch any. Everyone I have talked with who has caught fish in the past few weeks, including myself, have had the best luck in the 3-6′ depth range. My best fishing in late February and early March was at the shallow end of this 3-6′ range. I wondered if the guys I was talking with had been chasing fish that weren’t there or weren’t bass all day. I still wonder about that. What is your opinion? I think the best setup is to have a flasher in the front (keep things simple) and use the graph from the cockpit. The water temps of 60 degrees or more that we have been waiting for are here and so are the visitors. This weekend we had highs in the high 70s to 80 and lows in the 60s. The water is warm and the bass are getting active as the spawn begins. I did not fish this weekend but did walk down and see what a few boats brought in. Most said the fishing was tough but I did see some nice results from a few boats. In talking with them, grass and water depths from 3-6 feet were again the constants. Over the next few weeks I will be finalizing my move to East Texas by moving my stuff here from Florida (along with my boat…wooohooo) so I will not do much fishing. I am going out one day this week but that will no doubt be the last trip until around the end of the month when I am finally here and settled. My plan is to work the Senko and the Rattle Trap in the grass for Lake Fork bass. Results will be posted. I was on the lake yesterday and saw surface temps at 58+. The nights are now staying in the 50s and even 60s soon and the surface temps are at 60 degrees near the 515 bridge on the west fork. My guess is that they will be at or near 60 most everywhere in the next few days. Five hours of fishing brought only two slot fish yesterday, but I did get my heart broken by a nice bass. I got him about halfway to the boat before he got off…which leads me to a funny story. Tonight I was fishing from the dock (I will have my boat here by the end of the month) and saw one of my neighbors in the RV park on a boat headed for a dock where I missed that nice one yesterday. I figured it was about 6 pounds. After they had taken their boat out of the water I walked by on my way to my motorhome and asked if they caught a nice fish off of that dock. I told them I missed one yesterday that I though should be about 6 pounds. The gentleman looked at me and said, “He was 5-14.” They had just caught a fish in that size range on the same spot where I missed him. I bet it was the same fish. We all got a laugh, the fish is still there and we will catch him another day. The fish I caught yesterday, including the one I missed that my neighbor landed, I caught on a pumpkin colored Senko with black flake. I was fishing it in thick weeds and had it Texas rigged with no weight. I am having to throw it with a spinning combo and the rod is just not stiff enough for a positive hook set. I will find a better spinning rod and that won’t happen again. I am liking the Berkley Series One spinning rod for this task. I am thinking the 7′ medium heavy action will do for the weightless plastics. Cabela’s has this rod in stock and they are running a $5 coupon offer on Berkley products through September according to their web site. When I arrived at Lake Fork I knew I would be here a month or more without my boat. I knew that would drive me crazy and, yes, it did. Fortunately there are boat rental places all over the lake. Tom, a neighbor in the RV park, and I decided to rent a boat and give it a go on Lake Fork a few weeks back. The results of that trip are below. We fished for two days and came up with a few things about fishing Lake Fork this time of year. Look for water about 3-6 feet deep and grass, they are in the grass. I caught this 8 lb. 3 oz. bass on my first full day of fishing Lake Fork. It was 22 1/2 inches long and we released to be caught another day. I caught it on a 1/2 ounce crawfish color rattle trap. Tom caught this 5 lb. 2 oz. bass the following morning. Notice how the tail on this bass is worn and bloody. He has been making a bed. The time for big bass on Lake Fork is very near. He caught this on a Yamamoto Senko. Overall, we caught 15 and missed about 4 or 5. The two largest fish are shown. Most of the others were in the 3-4 pound range and I think we caught one small fish that was under the slot. All fish were released. Special thanks to Rick at Ricky’s Lake Fork Boat Rentals for a great boat, perfectly equipped. When you are looking for a boat rental on Lake Fork, check out Rick’s web site. Video recap of Tom’s and my trip.